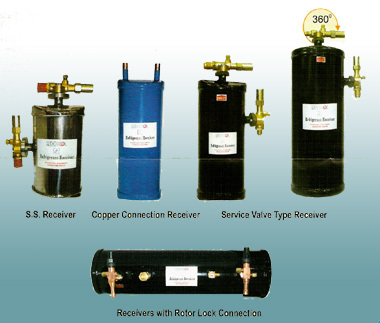 FK liquid refrigerant receivers provide a reservoir for refrigerant during normal system operation. Receivers are selected based on the operating charge for all system components and liquid lines. Direct replacement of popular competitive models. Powder Coating paint finish on exterior Body interior & exterior with special Chemical Treatment to prevent rusting but compatible with CFC, HCFC & HFC. Rotolock valve connection available on request. Horizontal receiver available on request.